Let's go make some fantastic tuna fish casserole! Boil noodles 'til ready (as per manufacturer's directions. When ready, rinse lightly by running under cool water (to stop noodles cooking). Set aside for later use. Fry onion and garlic in butter (or fat of choice) until onion is glassy. Add drained tuna and then soup (do not dilute the soup). Add pease and cook until done. Add noodles. Stir gently to avoid breaking the noodles. Cook until noodles are hot. If noodles stick to the pan, at a little water (a tablespoon or two). We prefer solid to flaked tuna. It can be broken up in the pan but always gives nicer tuna chunks rather than flakes which tend to melt into the casserole. 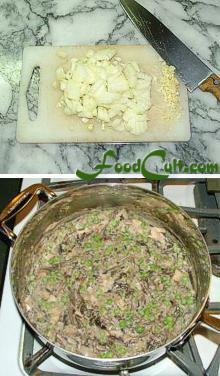 Tuna Fish Casserole (or "Tuna Casserole") is one of those wonderful, easy, stove-top meals. Not quite a one-pot meal, a second vessel is used to pre-cook the noodles. We use a paella pan (or larger pot or dutch oven) to prepare the other ingredients and to assemble the entire dish. Tuna Fish Casserole is ready fairly quickly. Tuna Casserole was a dish early in our repetoire. 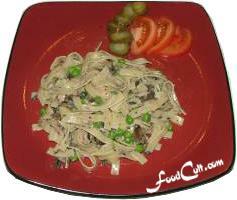 It satisfied, as young people, a need to have an easy, economical, quick meal that would yield leftovers to heat up, quickly and easily, the next evening. Nothing is as economical is it used to be ... prices invariably rise but it's still a satisfying meal made on the stove-top and it's still easy to make using a variety of ingredients including canned soup, a can of tuna, noodles and fresh and frozen vegetables and, in a pinch, it's still a meal we enjoy once in a while!